Earlier I have published few of Murder Mystery Puzzles which are very much liked by the visitors. So extended these puzzles which few more Murder Mystery puzzles. 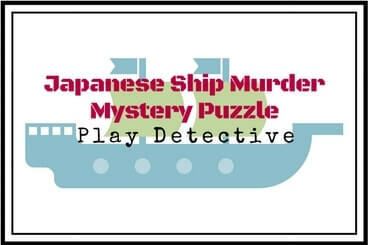 Here is Japanese Ship Murder Mystery Puzzle which is investigated by famous Indian detective Byomkesh Bakshi. Do put yourself into detective shoes and try to find out who is the murderer in this case. Answer link to this puzzle will be provided shortly. Lets see if you can solve it without looking at the answer? A Japanese ship is on route to Kolkata in the Bay of Bengal. Seeking the silent waves, the captain decides to take a nap. However is murdered while sleeping. When ship reaches the shores of Kolkata, city in the West Bengal of India, the famous Indian detective Byomkesh Bakshi is called to investigate the murder of captain. He reaches the ship immediately and after doing initial investigations, he short lists four crews members as suspects for this murder. These four members are called immediately and he asks each of these crew members that what they were doing during the time when captain is murdered? 1. Hideaki, the Cook: I was in the kitchen doing cooking. 2. Rokuro, the housekeeper: I saw that the flag hoisted on the ship was upside down, so I went to correct it. 3. Ken, the engineer: I was in the generator room, checking the generator. 4. Takeshi, the second housekeeper: I was tired and taking a quick nap. Byomkesh Bakshi immediately knew who the murderer was. Can you tell? 1. Fun Brain Teasers For Kids, Teens and Adults with Answers: Do solve many different types of Fun Brain Teasers which kids, teens and adults will love to solve. 2. 5 Awesome Brainteasers To Test Your Mental Sharpness: Here are 5 awesome brainteasers to test your brain power. These are the tough parking puzzles and sharp mental thinking will be required to solve these puzzles. 3. Tight Fit Sudoku Puzzles: If you like to solve printable Sudoku puzzles, then do checkout his very cool Tight Fit Sudoku puzzles. 4. Hand Made Word Search Puzzles: Most of the time Word Search Puzzles can be computer generated. Here is the attempted to create hand made word search puzzles. Do check it out.